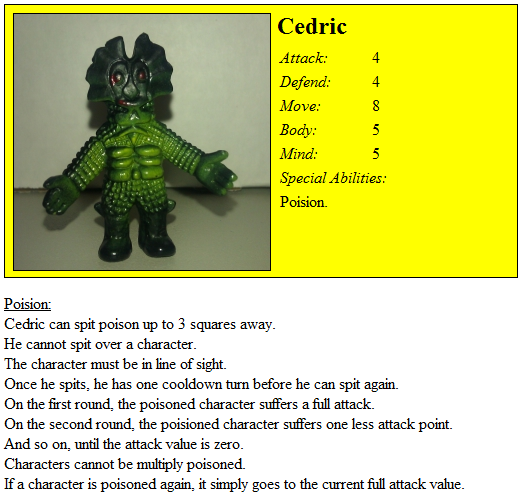 A while ago, I made a bunch of character cards based on some plastic figurines of creatures I had. The basic idea is a board divided into squares or hexes (hadn’t decided yet), with varying types of terrain (clear, elevated, rough, impassible), and game mechanics for basic attack and movement similar to HeroQuest. That is, each “attack die” has a 50% chance of scoring a hit, each “defend die” has 33% chance of defending. Movement is one square/hex per point. Body is hitpoints, Mind is mana. And the characters represent giant monsters. This could work as teams or in a battle royale type thing. 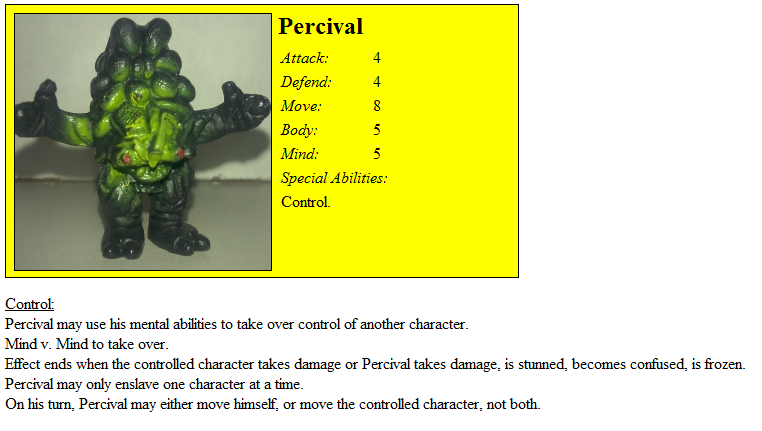 And, of course, each monster has a special power. I generally based it on what the character looks like. For example, Algernon has big ears, which reminds me of a bat, which reminds me of sonar, which leads me to think of a sonic attack. 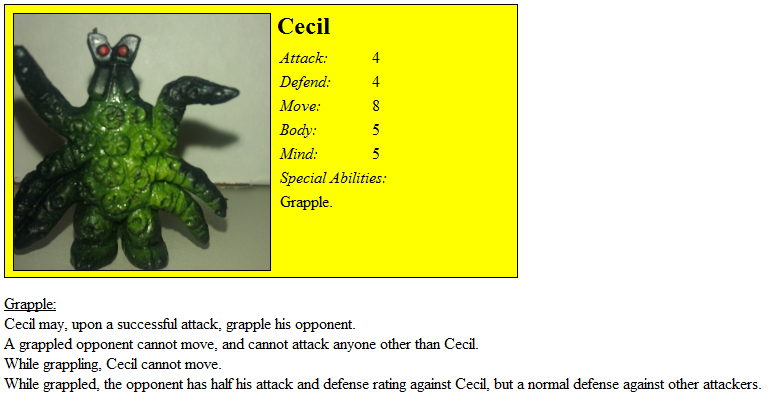 The following are the creature cards with their pictures. The stats are the same for all of them (they need tweaking that can only be determined in a play-test) but each has its special power listed and described. 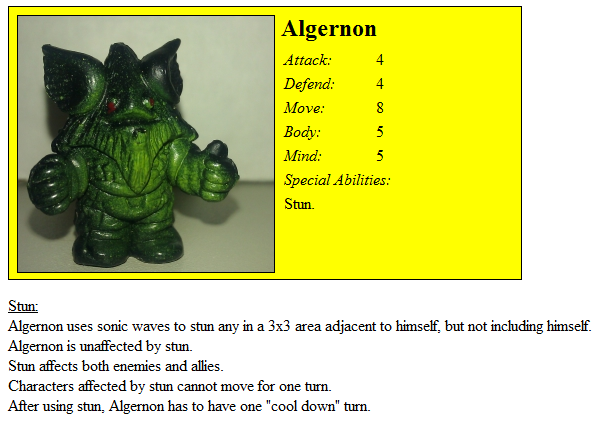 General turn sequence is that each creature gets to move and attack on its turn. The move can take place before the attack, or the attack can take place before the move. In my opinion, the best power is Oswald’s Shock ability. 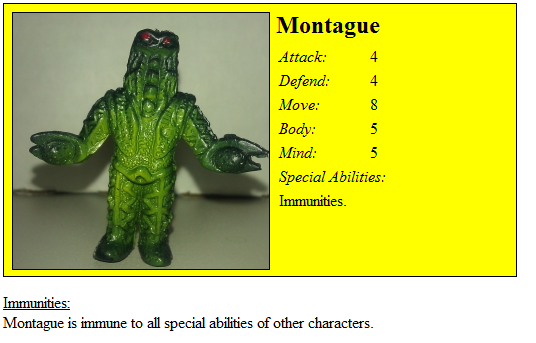 A close runner up is Montague’s immunity to everything. 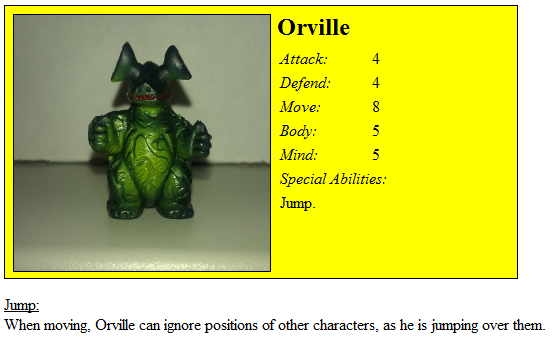 The worst is Orville’s Jump ability, but the dude looked like a kangaroo. A note about the names: I googled “wimpy names” and came up with most of the list, with the exception of Fluffy, who looked like a dog, so I came up with a wimpy dog name. I liked the dichotomy of wimpy names and giant monsters.